What was summer like in Door County in the early 1900s. If you were a local girl, you might clean rooms at a family hotel or help with farm chores. Perhaps you would tend to younger siblings. If old enough, you might even work at Camp Meenahga. Camp Meenahga was located across Shore Road. Camp Meenahga girls spent summer differently than young women of Door County. For eight weeks, at a cost of $350 (1924), campers had a "vacation from fashions and abnormal excitement." They studied dance, wood lore, sweing and "no more than one strenuous" activity, perhaps horseback riding. Many came from St. Louis. Once here, they enjoyed a daily swim and home-cooked meals. 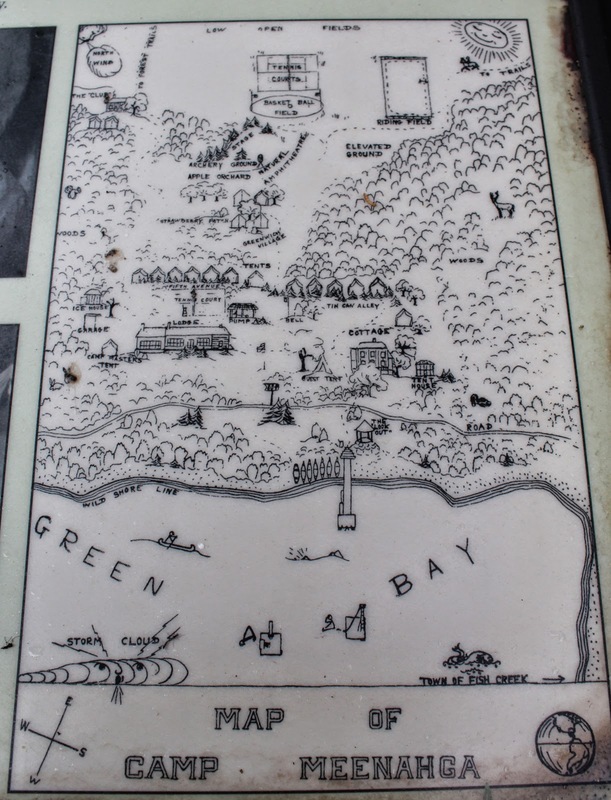 Farms, still located within Peninsula State Park at the time, provided fresh vegetables and milk. Walk across Shore Road to Skyline Trail and look for signs of Camp Meenahga. Can you see the foundations of the barn-turned-camp lodge? Walk further, watching for a stone fence that the Evenson family likely built when they farmed this site around 1900. Imagine sounds of laughter in the nearby tennis court as carefree girls learned the art of friendly competition. The marker is located deep inside Peninsula State Park, at the parking lot for the Skyline Trail trailhead, Fish Creek, Wisconsin 54212. Door County Photo: Bird's-eye view from Eagle Tower at Peninsula State Park. The marker is at the Skyline Trail trailhead.